Happy 3.14 – Pi Day! We can still get local apples at this time of year, and a handful of fresh or frozen berries make such a delicious accompaniment, adding a hit of tartness and colour to the usual apple filling. Virtually any kind of berry works, from blackberries to blueberries to raspberries – if you use strawberries, slice them first to more evenly distribute their juices. And get your kids in the kitchen to help! 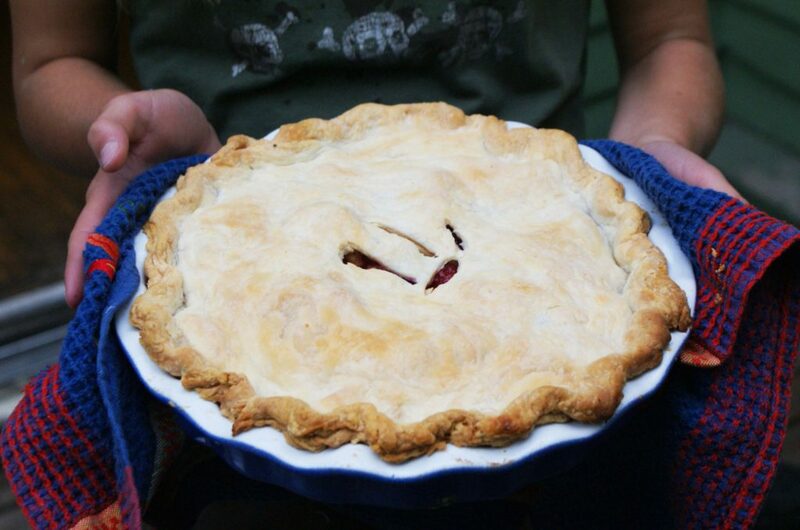 Since it’s Pi Day, you can even cut the Pi symbol into the top crust to allow steam to escape. Preheat the oven to 450F. On a lightly floured surface, roll half your pastry into a 10-12 inch circle, and transfer to a 9-inch pie plate, fitting it in without stretching it - let the edges hang over the side. Slice the apples into a large bowl. In a small bowl, stir together the sugar, flour and salt; add to the apples and toss them together. Pile them into the pastry, dumping any sugar left in the bottom of the bowl overtop. Scatter raspberries overtop. Roll out the remaining pastry and place it over the pie; trim the edges (both layers) to about 1/2-inch past the edge of the pie plate. Tuck and crimp however you like, using your fingers or the tines of a fork. Cut a few slits in the top to allow steam to escape. If you like, brush the top with milk or cream, and if you like, sprinkle with a spoonful of sugar. Bake the pie for 10 minutes, then reduce the heat to 350F and bake for another 45-50 minutes, until golden and juices are bubbling out through the slits. Cool on a wire rack. Posted in Recipes, Desserts and tagged recipes, pie, desserts.